Why do I say that? Open your fridge, and tell me if there’s at least one apple sitting there. I know most people keep apples in their fridges. When my parents go fruit shopping, apples are a no brainer. I have apples at home everyday. Sometimes it’s red Royal Gala, and other times, it’s green Granny Smiths. Dad loves buying fruits and it’s always fun when he gets into his ‘fruit-crazes’. Sis and I always have a good laugh about it when we reminisce the times when he would buy home huge amounts of papayas, or mangoes; depending on the season. Seriously, I kid you not! Apparently when he is in an ‘orange’ mood, there’ll be loads of oranges in the fridge. It’s quite fun actually. That’s one reason why I love to open the fruit compartment in my fridge. Sometimes I’ll be surprised by a lovely ripe mango or some starfruits and on certain days, just plain ‘ol apples. Apples are awesome, in my perspective. Afterall, they do keep the doctors away, no? Some like theirs crunchy but I like mine soft. Weird eh? When I mean soft, I mean a soft bite – those tend to be sweeter. Crunchy hard apples have a more tangy bite. Hmmmm haha that’s applogy talk! 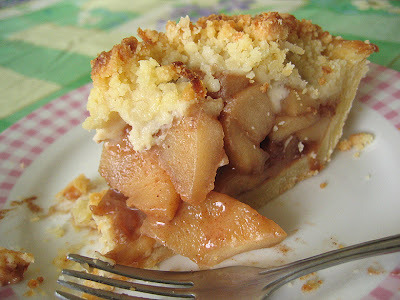 I like apples by itself but I think the best way to have them in dessert form is a la pie or baked. Baked apples exude a certain sweetness that simply hits home. It’s that homey feel you get – the warm and soft sweet flesh that goes so well with cinnamon, brown sugar and raisins. Mmmmm…. Superb. Although I like apple pies I haven’t made them. 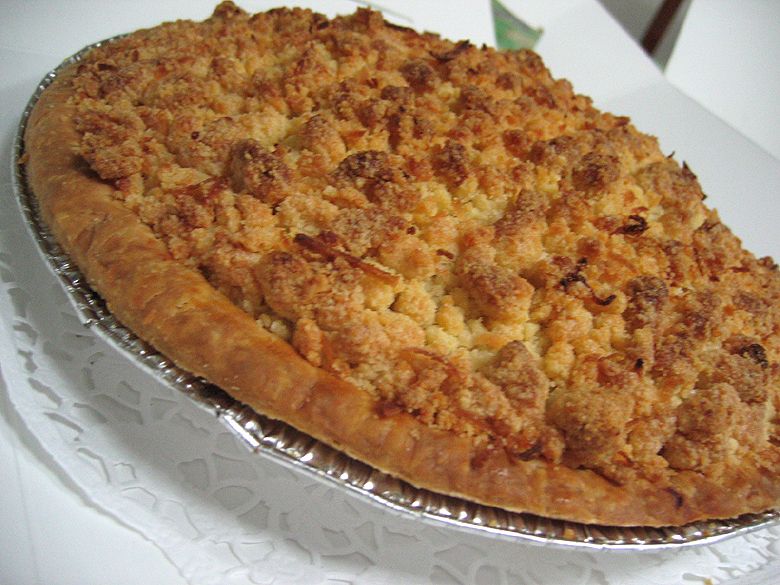 Have only made apple crumble and just recently, apple cobbler. Today I want to talk about both apple crumble and apple cobbler. I’m really fascinated at our ability to play around with flour and come up with so many variations of something good and simple. Those of you who bake often might know the difference between a crumble and a cobbler. A crumble is when you mix dry ingredients like oats, cinnamon, brown sugar and flour with butter till coarse crumbs form and then you simply sprinkle them over your prepared fruit dessert. Cobblers however, are usually made with wetter ingredients like milk and eggs. So what you pour on top is usually a wet batter that covers the entire surface of your fruit dessert. I know crumbles and cobblers aren’t exactly common desserts found in Asian countries like Singapore so I was ecstatic when Calendar’s sent me a huge 1.7kg apple crumble to try. You might remember me posting about their carrot cake the other time. Well their chocolate cake and apple crumble is really worth a mention as well! But I’ll comment on their apple crumble today. Calendar’s uses coconut in their crumble topping, which gives it a nice sweetness which I love! They make theirs with fresh apples (duh!) and plenty of raisins and cinnamon. I really like my cinnamon so naturally, I adored their apple crumble. Once again, my family was won over by their apple crumble. 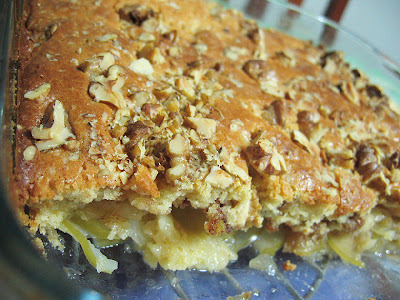 Let me tell you, we finished the apple crumble within 2 days! Can you imagine? hahaha… I told you my family eats well. Tastes even better warm. Dang, I wish I had some vanilla icecream to go with it. If you haven’t tried apple crumble in your life and are simply too lazy to make one yourself, please do yourself a huge favour and order one from them. You have my promise that you won’t regret it! Have I ever lied? Since that apple crumble, I’ve been thinking alot about apple desserts. And it helped that we had so many Granny Smith’s at home the other day. Mum asked me to quickly eat them. But I thought, hey instead of forcing myself to chomp on all of them (haha, okay, it wasn’t as if she wanted me to finish them all), I thought why not make some apple crumble. However, I realised I didn’t have coconut or rolled oats and I wanted to try something different anyway so I googled for an apple cobbler recipe and found one easy one. 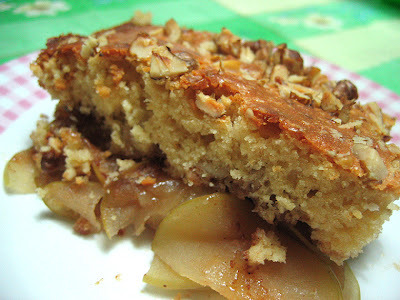 It called for walnuts too and I happen to have some at home so in I went to the kitchen and within an hour, we had some yummy Apple Walnut Cobbler to chow on! I sliced the apples really thinly so you can’t really see them here. But it tasted really good. Simple and so easy to make. Honestly, I didn’t know the difference between an apple crumble and an apple cobbler until I tried out this recipe. I mean, i’ve always heard of peach and blueberry cobbler but I never really thought or researched into how they were made. But hey, we learn something new everyday, no? Combine the sugar, cinnamon, and 1/2 cup of the walnuts. Spread the sliced apples in the bottom of a greased baking dish (8×8). Sprinkle the apples with the cinnamon sugar mixture. Sift the flour, sugar, baking powder, and salt together in a small bowl. In a large bowl, combine the egg, evaporated milk, and melted butter. Stir in the combined dry ingredients and mix until smooth. Pour over the apples in the baking dish. Top with remaining walnuts. Bake at 325F (170 degree celcius) for 50-55 minutes or until golden brown. Serve with ice cream or whipped cream. Hi! It looks reaaaally yummy!! What are tart apples? And is it plain flour you used? that looks delish. I was looking for more ways to turn an apple into something more than a crumble. Will definitely try this. thanks for sharing! Strangely, as much as I love all things baked, I have never been a baked apple guy. I like the crisp crunch of a ripe Granny Smith, possibly spread with some peanut butter, instead! Now where can you get a good Ganny Smith here in S’pore? i just tried the recipe. i used a 9×9 baking dish, so the topping didn’t quite cover the apples. but it still turned out quite nice. i usually have fuji apples in my fridge, no not the ones directly from Jap. hehe..
let me ask sis to bake the one from your recipe. it looks diff from the ones she usually make. sis bakes, bro gets to eat! (sneaky laugh). i would like to try/order your apple crumble. do you take orders? Hi, I tried this yummy recipe but substitued the sugar with brown sugar. 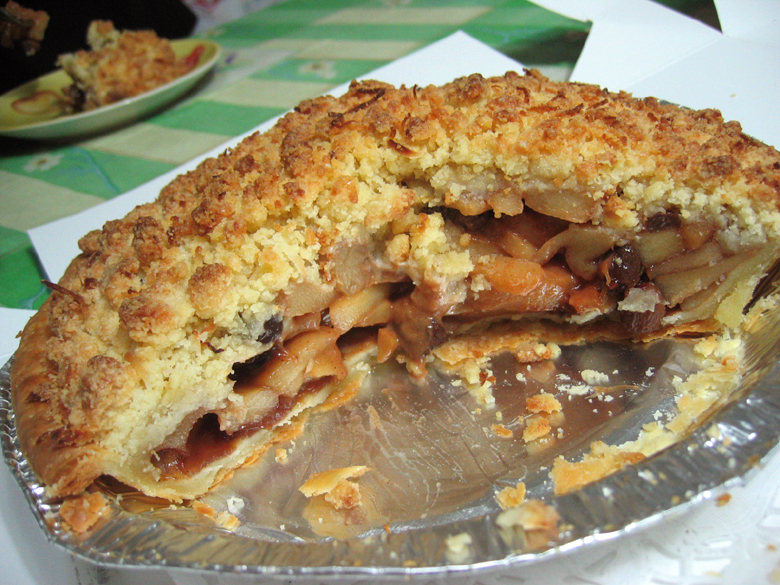 And like joop, my topping didnt cover all the apples. Nonetheless it tasted great. My husband thinks I’m some kind of whiz in the kitchen now. Little does he know how simple this is to make. We both finished the entire cobbler over the weekend. 🙂 Thanks for this wonderful recipe!